This Titleist Players 4 Stand Custom Golf Bag features a double-to-single convertible strap system for easy carrying. The proprietary stand makes it easy to get the club you need! This Wilson Profile Carry Custom Golf Bag is lightweight and features a kickstand making it easy to use out on the course. The double padded strap ensures comfort during a long game. Give gifts of luxurious, sporting style and sophistication with beautifully branded custom golf bags for the golf players in your life. In our custom creation process, ePromos uses world renowned brand manufacturers to bring your company and clients the most elite custom logo bags available. The finished products are on par with today's sponsored professional golf tour bags, even to the point of being heirloom quality that you can share with sons and daughters. Golf bags make generous gifts for the golf enthusiast or even the casual golfer. What a surprise! Your clients will be thrilled and the gift will create enthusiasm for your business for the long run. Golf bags also make great holiday gifts or are appropriate when a well-earned congratulation is in order. These unique logo bags are a class act; celebrate the special relationships you have with clients, employees, and friends by giving them promotional golf bags of a lifetime. A great golf game is relaxation time that you can use for socializing and networking. Relationships and business climates are strengthened over a beautiful day outdoors, some friendly competition, and maybe even a refreshing beverage or two. What a thoughtful gesture that will show your clients you know what's important to them by celebrating their passion of the game. There are many lightweight promotional bags for those times when you want optimum agility and endurance when walking around the green. Our lightweight golf bags are weather-protected, comfortable to carry, and fit nicely in the golf cart. Some of our more opulent custom gift bags feature amenities and features that really bring luxury to the course. 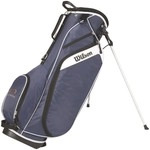 These bags keep all clubs, equipment, and accessories snug, and offer extras such as beverage coolers and rain umbrellas. These promo bags are truly special gifts no need to be shy, we know you'll be carrying your very own logo golf bag to showcase your brand name on the green.